For the second successive year Drive has crowned the Volvo XC60 'Best Luxury SUV under $80,000'. The XC60 notched up a comfortable victory with 28-points, once again winning over the judges with its style, sophistication and safety. Volvo's compact SUV the XC40 was the runner-up to its bigger sibling. "Just as it did last year the XC60 impressed with a comfortable ride on its optional air suspension, but is also surprisingly dynamic when pushed to its dynamic limits. The harder you push it, the more you ask of it, the better it performs," said one judge. "Volvo takes safety a step further with the XC60 offering the head-on mitigation system that can detect oncoming traffic and steer the vehicle back into its lane. That was a world-first and won Volvo the safety innovation prize in 2017. It's part of the XC60's Pilot Assist semi-autonomous system that makes this the safest choice." The Drive award is the fourth major automotive accolade notched up by Volvo in 2018, and continues an outstanding performance by Volvo in the highly competitive luxury SUV segment. 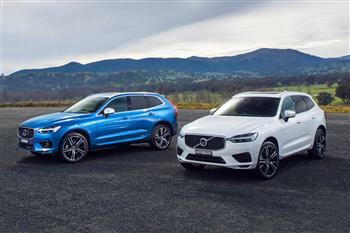 In January the Volvo XC60 was named 2018 Wheels Car of the Year and in June the Volvo XC60 D4 Inscription was voted Australia's Best Cars category winner by taking out the Best AWD SUV $65,000 - $125,000. In November the Volvo XC40 was crowned Carsales' 2018 Car of The Year. The Volvo XC60 T6 R-Design was also recognised by receiving the Carsales 2018 Highly Commendable Award. Volvo Car Australia Managing Director Nick Connor said 2018 has been a highly successful year for Volvo Cars in Australia. "Winning four major automotive awards in 2018 is a fitting tribute to an incredible year for Volvo, and is testament to the evolution and growth of our brand in Australia which is one of the most competitive car markets in the world." Mr Connor concluded. For the 2017 financial year, Volvo Car Group recorded an operating profit of 14,061 MSEK (11,014 MSEK in 2016). Revenue over the period amounted to 210,912 MSEK (180,902 MSEK). For the full year 2017, global sales reached a record 571,577 cars, an increase of 7.0 per cent versus 2016. The results underline the comprehensive transformation of Volvo Cars' finances and operations in recent years, positioning the company for its next growth phase. In 2017, Volvo Cars employed on average approximately 38,000 (30,400) full-time employees. Volvo Cars head office, product development, marketing and administration functions are mainly located in Gothenburg, Sweden. Volvo Cars head office for China is located in Shanghai. The company's main car production plants are located in Gothenburg (Sweden), Ghent (Belgium), Chengdu and Daqing (China), while engines are manufactured in Skövde (Sweden) and Zhangjiakou (China) and body components in Olofström (Sweden).